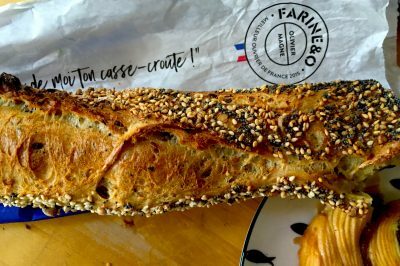 Recently, ahead of exploring the formerly sleepy Batignolles district in North Paris, I caught wind of a much-buzzed-about new restaurant in the area, and booked a table for one on a warm August evening. 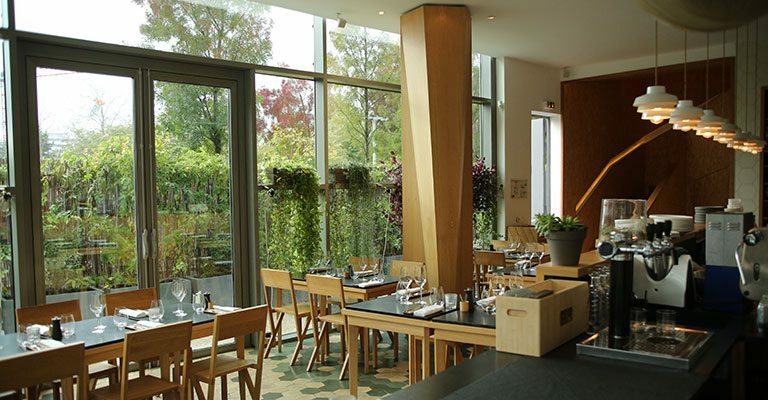 Situated at the edge of the Martin Luther King, Jr. park and named in honor of Dr. King’s wife, the civil rights activist Coretta Scott King, Coretta is a breath of fresh air in what was at risk of becoming a predictable and staid French cuisine scene in the capital. Opened in 2015 by Matthieu Marcant and Beatriz Gonzalez, the couple behind the already-lauded Neva, the restaurant’s kitchen is helmed by Gonzalez and her co-chef Jean-François Pantaleon. 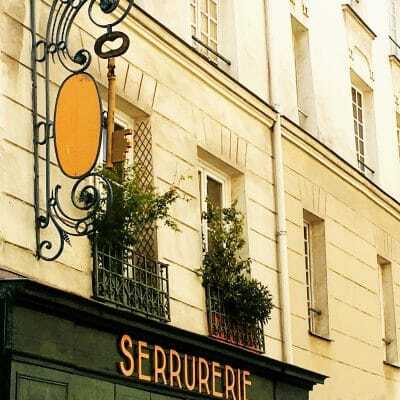 The latter earned his chops at 3-Michelin starred Le Meurice and other high-end Parisian tables, and that gastronomic pedigree is more than evident in the restaurant’s beautifully presented, marvellously flavorful and innovative dishes. 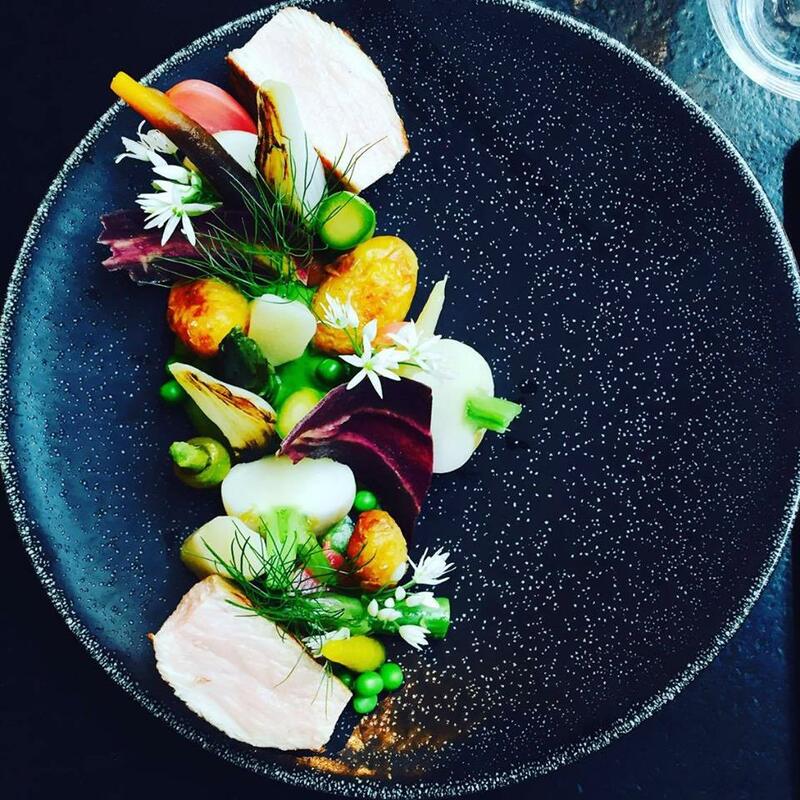 The emphasis is on locally sourced ingredients, lightly cooked and artfully plated produce (edible flowers and bright sprouts abound in their dishes), and fresh new flavor combinations. Somehow, even though “Asian fusion” approaches in French cooking are nothing new, the use of notes such as wasabi, ginger and sesame don’t feel tired at Coretta. Read on for my full verdict on the cuisine, and the overall experience. Being one of those balmy Parisian summer evenings (and a sunny one, at that), I snagged a table outside on the terrace and immediately ordered a glass of Pouilly-Fuissé, a Burgundy white wine from the Macon appellation that’s one of my go-to varieties. The servers– I had at least two over the course of the meal- were warm and friendly, taking me through the seasonal menu in a way that shyer or uninitiated visitors would likely appreciate. 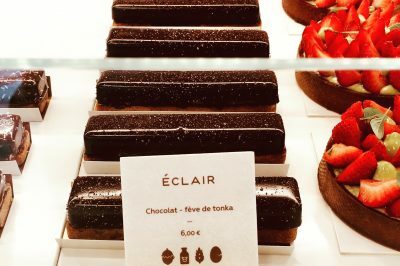 While there’s a definite high-end feel to the place, the atmosphere isn’t intimidating or pretentious, as it can be in so many “haute cuisine” places in Paris. The servers affably answer any questions you may have, and generate a sense of excitement about the show to come. Call it gourmet sans snobbery: the only kind I approve of. 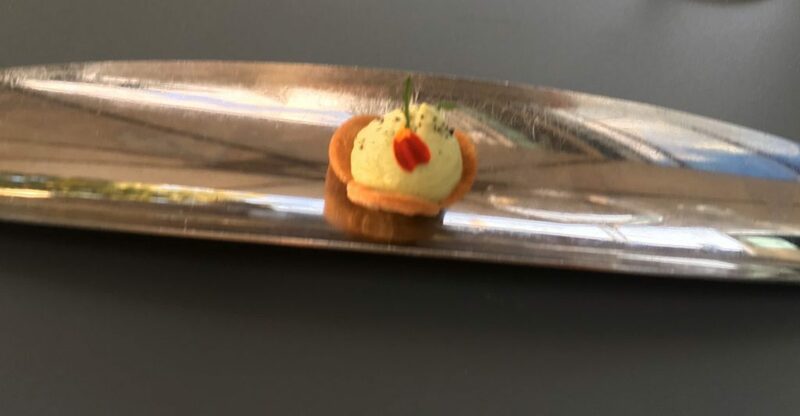 After bringing me a basket of warm bread accompanied with herbed and salted butter (all sourced from local suppliers, I was told), I was presented with an adorable amuse-bouche: a miniature savory “tartelette” filled with a vegetable mousse of some kind, and delicately adorned with a tiny flower petal. Next, for the entrée– confusing enough for English speakers, this means “starter” in the Gallic tongue-– I was regaled with a fresh gazpacho made with “ananas-zebra” tomatoes, a new hybrid heirloom breed, and delicately topped with marinated gambas (shrimp), summery red and yellow tomatoes, new sprouts and a dollop of creme fraiche. Light and subtly flavored, it’s a refreshing first course that was perfect for a dusky summer evening. It made me remember what “real” tomatoes taste like—and how divine they can be. 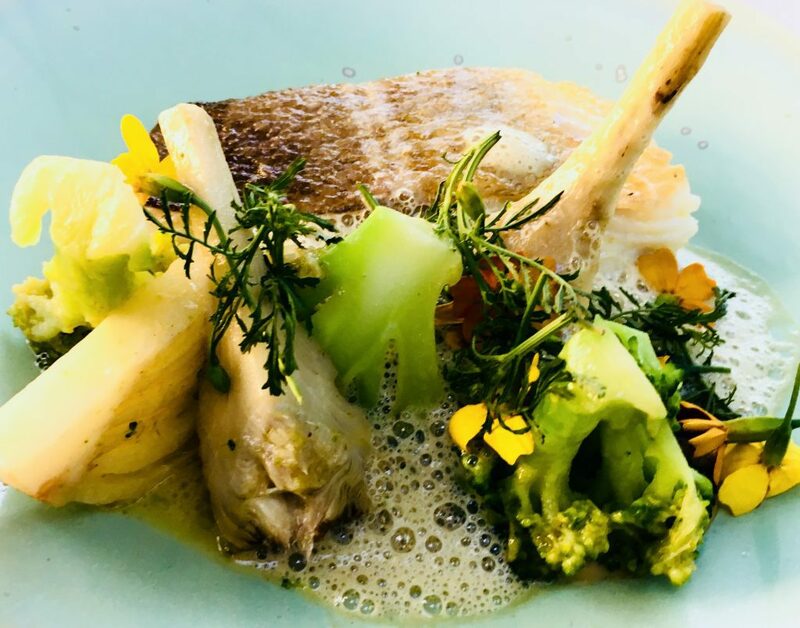 A catch of the day main course at Coretta in Paris: delicate sea bream with peppered artichokes, fennel, broccoli and decorative edible flowers. Courtney Traub/All rights reserved. Next, for the main course, I tucked into a beautifully plated plate of pan-sauteed fresh fish (catch of the day– I believe it was sea bream), decorated with and complemented by tender and crunchy broccoli, peppered artiche hearts and braised fennel. The sauce, buttery and citrusy, didn’t get in the way of the fish’s native flavors, nor of the beautifully simple vegetables. While I’m a (mostly) vegetarian who occasionally eats fish when out and about, I carefully noted that Coretta’s meat-based dishes place an unusual emphasis on fresh produce. One example from a seasonal menu of theirs: roasted veal chop with “pathfinder first spring sprouts”. 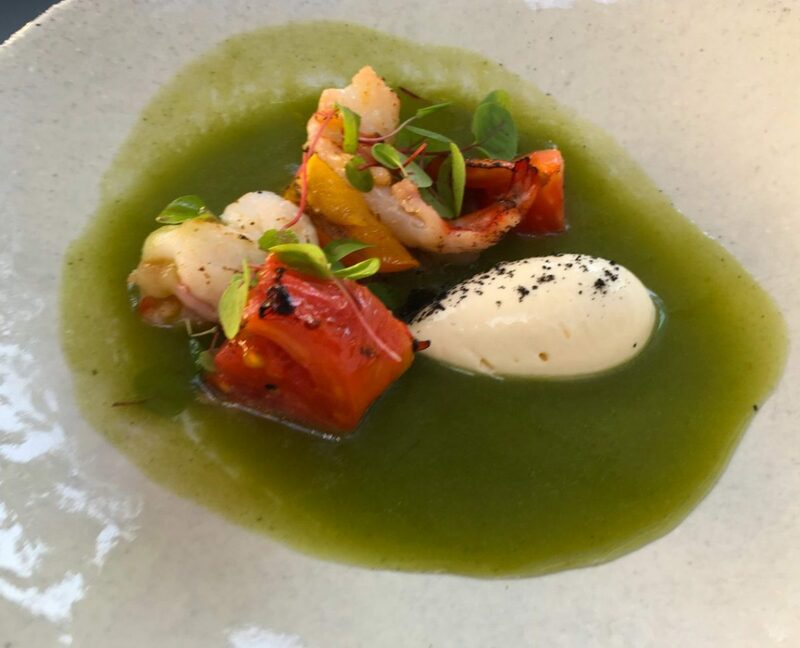 It’s refreshing to see a restaurant that already emphasises “locavore” cuisine and ingredient sourcing make vegetables such a focus, even in a dish for carnivores. Not to editorialize too much in the middle of a restaurant review, but from an ecological standpoint this is precisely the sort of ethos we need more restaurateurs to adopt. That said, I was a bit disappointed by the lack of “proper” vegetarian options on the menu. 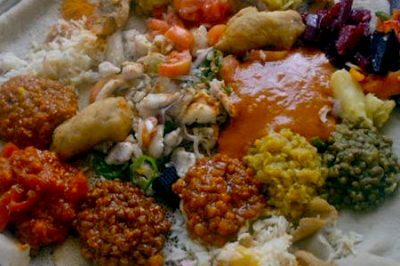 Many restaurants in the capital have been amending that problem– and deliciously so— so it’s my hope that this one will expand its repertoire in the future to accommodate strict non-meat-eaters. An individual “pain perdu” brioche cake accompanied with salted caramel and ice cream. Courtney Traub/All rights reserved. Having enjoyed a meal that was relatively light and healthy, I expected to have plenty of appetite left in reserve for dessert. 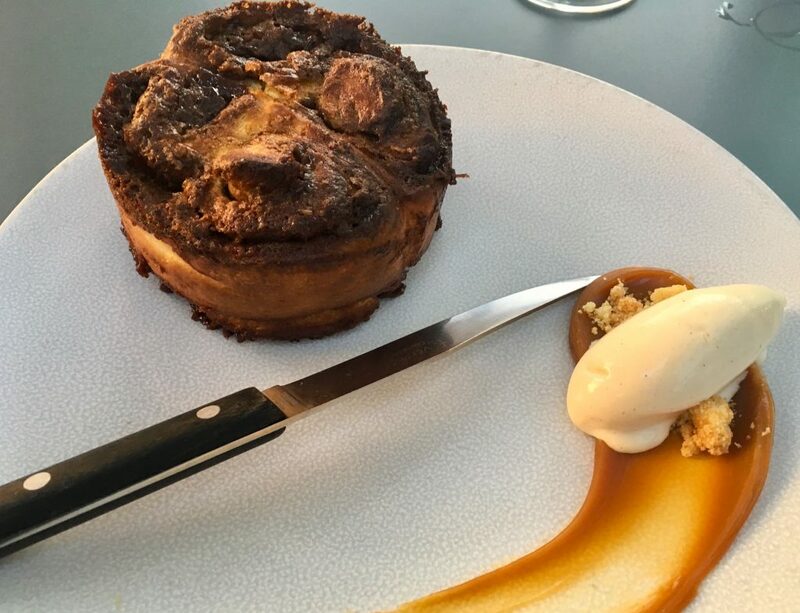 When the server re-emerged, carrying a plate bedecked with an enormous, delicious-looking portion of homemade brioche cake accompanied with salted caramel and a delicate dollop of vanilla ice cream, my first thought was that it could easily serve two. Still warm, with a crunchy, caramelized outer crust and a sumptuously buttery interior, the brioche marked an impressive finale to a wonderful solo meal. Perhaps if I hadn’t been in public, I would have eaten the whole thing in a sitting, but shame finally won over– so I wrapped half the remaining brioche in foil to enjoy the next morning for a decadent breakfast. 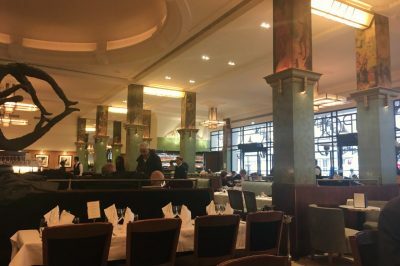 One last note: the server was quite amiable about my request to have something to wrap it up with, which surprised me a bit: it’s considered rather gauche to ask for a “doggy bag” in most restaurants in Paris– especially higher-end ones. I was shy about requesting one as a result, and relieved not to be rebuffed. That brioche was not going to waste if I could help it. The server’s laid-back attitude on this point only reinforced my overall verdict: not only is Coretta helping to revive the creativity and modernity of French cuisine in the capital: they’re doing so with none of the pretentiousness or fussiness that can make nights out at “noteworthy” restaurants a bit of a stiff and tiresome affair. This is certainly an address I’d recommend that you beeline to, before it snags a Michelin star and becomes far pricier. Somehow, I expect that might just happen, too. If so, you may want to consider booking a highly-rated gourmet food tour here (via TripAdvisor).